The Mackerel are here already. You might find it hard to believe but they have arrived. I know that there had been one caught last weekend at Preston beach in one of the matches, but I dismissed that as a straggler. However yesterday, I was walking my dogs on the cliffs on Portland and I could see several large shoals of fish breaking surface in Chesil Cove. From the distance I was at, it was impossible to tell whether they were Mackerel or Herring, but I would guess that they were Mackerel, but at this time of year it could easily be a mixed shoal. If you decide to go fishing this weekend then it is well worth having a go with some feathers. The other species worth having a go for are Plaice, which are also in very early. A good number of anglers fished Chesil over the past couple of days. The main species caught were Dogfish and the odd small Whiting, but a few Plaice did show in the catches. Chesil Beach: Calm with lightly coloured water. Chesil Beach forecast: with conditions on Chesil becoming better for Plaice everyday, I can see a lot of anglers heading there this weekend. Especially marks such as Abbotsbury and West Bexington. If you are planning a trip for Plaice, do remember that it is very early in the season, so don’t expect that many fish to show. If recent reports are anything to go by then you will be kept busy with Dogfish, even during the day. As I mentioned earlier, it is well worth having a go for some very early Mackerel or Herring. If you are targeting Herring Then use small Sabiki lures. Portland: the water will continue to clear over the next few days and this should meen that the Pollock will be around as well as the chance of getting a Wrasse. I will be targeting both species on lures this weekend if the conditions stay as forecast. Portland Harbour: the harbour will produce a few Flounder, but will be pretty quite for most other species. Weymouth Bay: Preston Beach produced a few species last weekend including Smoothound and Plaice. The piers are always good for Pollock, Pout, Flounder and the odd Herring. I know it is early but the first of the Thin Lipped Mullet may arrive at any time. Guiding: With winter well and truly here the guiding for the next couple of months will be concentrated on Flounder, Wrasse and Whiting. However it wont be long before the Plaice return again and the first of the Mullet. It is advisable to book early for a guiding session this year. I am limiting my guides to 100 this year, which is a 30% drop from last year. I want to concentrate more on creating videos. However we can offer guided services in Poole and Plymouth, as well as the North East of England. If you would like to be a Fishing Tails guide then please contact us for more details. 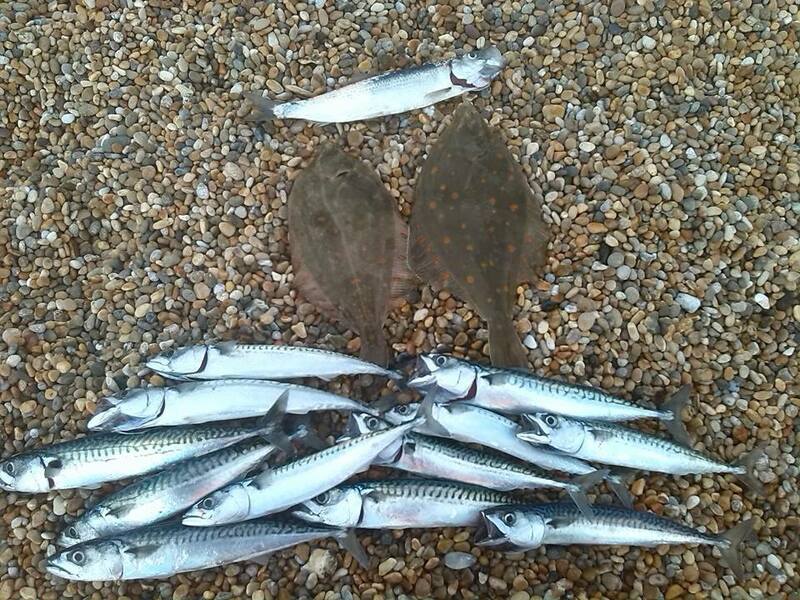 9 Responses to "Early Mackerel"
Hi Sean it’s Scott from Portsmouth ended up fishing Ferrybridge on Wednesday. Had a nice plaice first cast about 1lb 8Oz then when it got dark had loads of dogs and pout. There was a few fish jumping out of the water very close in and they looked like small mullet or herring. We did better for species on Wed at Abbotsbury (right side of car park looking out to sea). I got 4 species (whiting, large pout, dogfish and rockling) but the old man Steve beat me again to the finish post with same species + a Smooth Hound! We were after flounder cod and bass, but hey ho, at least we had 5 different species between us on a lovely sunny day. She who didn’t snooze, still loses! What does the post SAY? ?